Some of the most beautiful fall sceneries in Jeju are the fields of Eulalia swaying in the wind. Whether you are driving along the coast or climbing one of Jeju’s many oreums, you can see this familiar foliage, also known as silver grass. Wind is a natural element and its physical form is hidden to the naked eye. Yet we can feel its movement and observe the way it affects everything it touches. 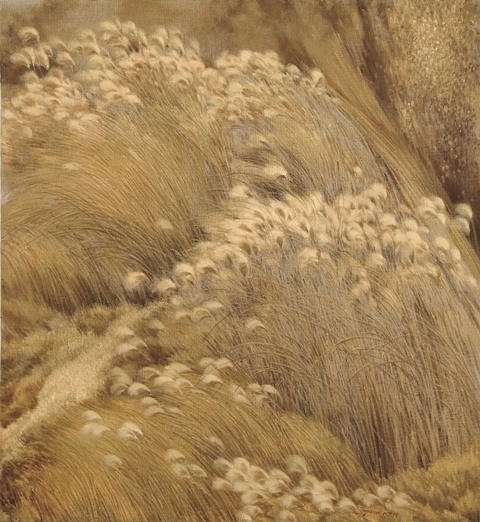 In Park’s paintings, one can see the effect of the wind on the Eulalia. Whether it is a strong force bending the silver grass with its power, or a soft whisper gently caressing the blades, the wind makes music as it intertwines with the grass. Can your heart hear a symphony or a lullaby? Like a photographer who focuses on one subject with different camera lenses and angles, Park Gwang-jin puts his heart into painting different perspectives of Eulalia. One image shows fields of silver grass where each plant is just a stroke and a dot that blends into one another, while the next one highlights individual Eulalia in full bloom, tempting you to reach into the painting and feel the soft blossoms with your fingertips. Besides painting silver grass in its natural habitat, Park Gwang-jin also plays around with geometric shapes and patterns. By contrasting black and white lines with his golden palette, Park brings a contemporary flair to his western-style painting. Since all the artworks are on the same topic, I had to carefully observe each painting in detail in order to see its unique beauty. 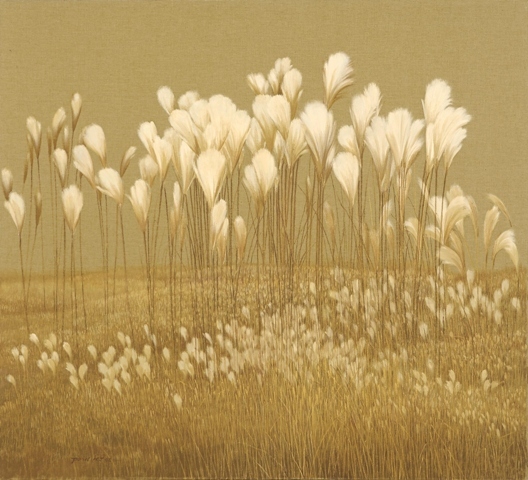 When I took the time to be still and look at each canvas, I felt drawn to the Eulalia over and over again, because each piece captures a different aspect of silver grass. Thank you Park Gwang-jin for making me fall in love with Jeju’s Eulalia once again. Come to the Jeju Museum of Contemporary Art to see 'Wind, the Sound of Eulalia', where you are actually surrounded by the peaceful nature of Jeju while enjoying paintings of Jeju’s beautiful nature. This exhibition opened last month and will run for one year until September 10, 2017.